When it comes to giving presents and dealing with family during the holidays, gender is a difficult subject to broach. Even when going to buy presents, it's impossible not to be swept up in the hype of "girl toys" and "boy toys." Luckily, The President, The First Lady and The Jolie-Pitts are being excellent role models for us this holiday season. At a Toys for Tots event in early December, The President and The First Lady refused to put all the sports toys into the "boys" bin while sorting presents for children. And while there's no mention of him putting some of the "girl" toys in the "boy" bin, at least it's a step, right? Of course I'm certain that while some girls will be excited to open a racket ball set on Christmas morning, some boys would be just as happy getting a Lisa Frank lunch box or an entire set of Disney Princess dolls. It is a good reminder, however, no matter how little that neither gender is relegated to certain types of play things and that dolls and tea sets won't, as my parents feared, turn their child gay or into a girl. 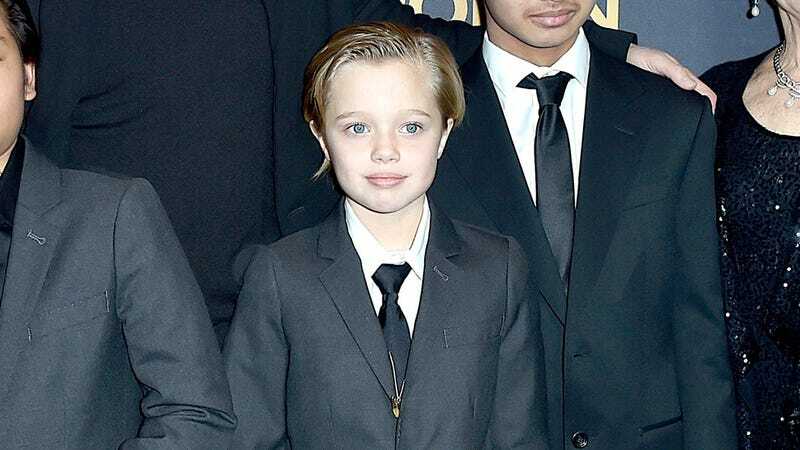 Even more recently, news has come out — according to "sources" — that Shiloh Jolie-Pitt, who's been a "tomboy" for years has asked to be referred to as John, wears boy's clothing and chose to wear a tux to the premiere of Unbroken, prompting media outlets to start speculating about John's gender nonconformity as well as applaud the Jolie-Pitts for their support of their child. And while that's awesome and will continue to propel us forward to acceptance and tolerance —never read Twitter, though — Nico Lang, in an excellent piece for The Daily Dot points out that this same kind of support isn't given to gender nonconforming adults (especially in the case of Bruce Jenner) and that while as a society we "allow kids to be kids" that this same kind of tolerance isn't extended to adults. ...we need to have the same conversation about gender non-conforming adults. 2014 was a reminder of how much work we still have to do in when it comes to recognizing the fullness of transgender, gender non-conforming, and intersex lives. Whether it was Grantland's Caleb Hannan outing a trans womanagainst her will, an editorial syndicated by the Chicago Sun-Times insisting that "Laverne Cox is not a woman," or hysteria over Michael Phelps' intersex girlfriend, Brad Pitt and Angelina Jolie reminded us that Bruce Jenner's nail polish isn't the problem. The problem is that we see anything wrong it to begin with.